Each time I drive down Lake Street in Sherborn, I remember Peggy on her bike, cycling to Farm Pond in the summertime. And each time in summer when I top the hill at the Pond and start down the steep path to the beach, I think of her settled in a sand chair, immersed in her book. I was always glad to see her, she was my friend in the crowd. I missed her when she moved to Essex, but I was glad because the beauty there would be such an inspiration for her art. And what an artist! You have done a wonderful job collecting her work in various medias--I really enjoy the web site. The sunspot series (of Trustees fields off Forest Street in Sherborn) and the Outer Cape works especially touch me. I also remember a wonderful triptych she did of the rambling yellow farmhouse in Dover, visible across the Charles River from the Sherborn side. And now it's been a year. The first year is the hardest. Little by little...We will always remember her, and we have her wonderful work. I am sure her spirit is with you three. 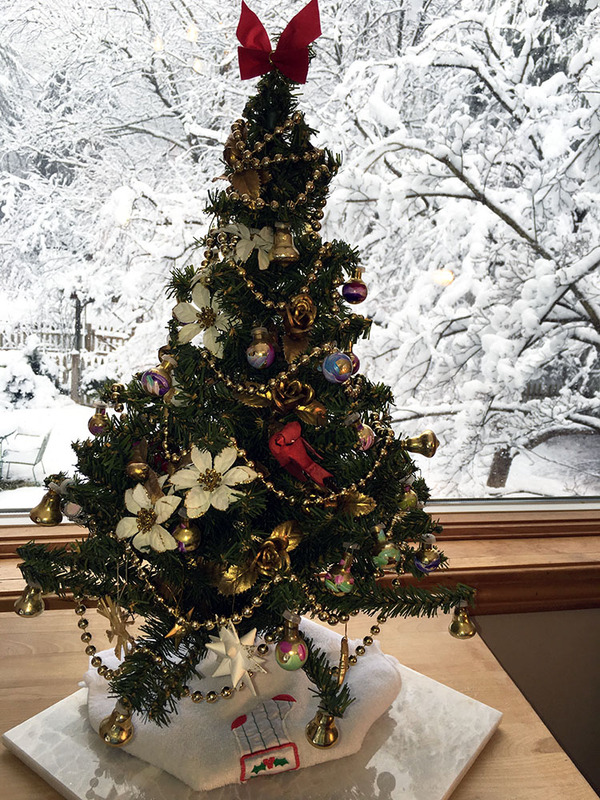 Attached is my one piece of Peggy's artwork, which I treasure: a tabletop Christmas tree she decorated that I bought at a Sherborn Community Center fundraiser. She swore she would never do another, it was such a pain! I fiddle with it each year, but it doesn't ever look as good as when she arranged it. I am so glad I have it.